This is the first in a new NBC 4 series documenting happenings on the New York City subway from week to week. Some 5.6 million people ride the subway each day, which makes it not only a hot spot for talent scouting and people watching, but also a snow-globe of sorts for some of the strangest behavior in the city. This week: a man smoking underneath a train, a serious breach of subway etiquette and twin buskers who have an uncanny vocal resemblance to the Beatles -- there was no shortage of weird and wonderful events on the New York City subway system. Without further ado, here are the top 4 moments from the subway Feb. 22 to March 2, plus a dash of dog. The week in the New York City subway was off to a typically weird start, as a cigarette-smoking man was caught on camera crouching under a train as it pulled into the station Monday. In a video posted to Instagram, the man was caught on video jumping onto the tracks in front of a B train as it pulled into the station. The unidentified man then stuck his arm through the space between the train and platform, cigarette still alight and in hand. After climbing back out of the tracks, the man tap-danced his way across the platform as FDNY officials approached. 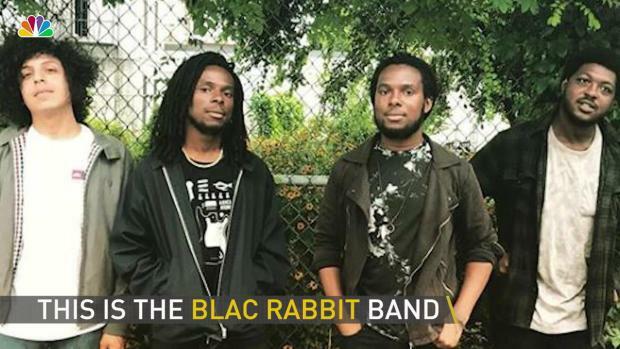 New Yorkers are freaking out over the performances of Brooklyn band Blac Rabbit. We just can't play them to you. Come Tuesday, New Yorkers had forgotten about the tap-dancing, cigarette-smoking gentleman and were getting excited about something else: a pair of subway performers who sound exactly like the Beatles. A former music writer tweeted a video of the buskers (who also happen to be twins) performing "She Loves You" at 14th Street Station, and by Tuesday they'd gone viral, with the video viewed more than 2 million times. The resemblance was so uncanny that some doubted the performance was real. "Sounds dubbed," said one skeptic, to which the performers -- a band calling themselves Blac Rabbit -- jumped into the conversation to say, "Lol wish we had the tech to dub ourselves out there!" 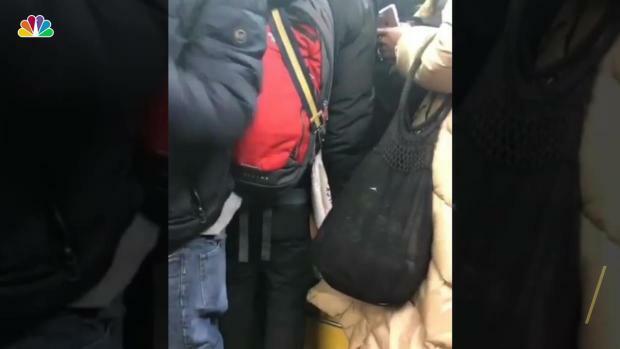 An anonymous woman is drawing criticism after this video of her trying to get onto an already packed train went viral. Come Wednesday, a breach of one of the unwritten subway laws was riling New Yorkers in a big way. A video of a woman cramming herself onto a train already so packed the doors would not close drew the ire of hundreds on Instagram. "That bag won’t even fit ... where does that last person think they’re going," one user commented, incredulous. "This was stressful to watch," said another. At least 200,000 had exposed themselves to that potential stress by Thursday. 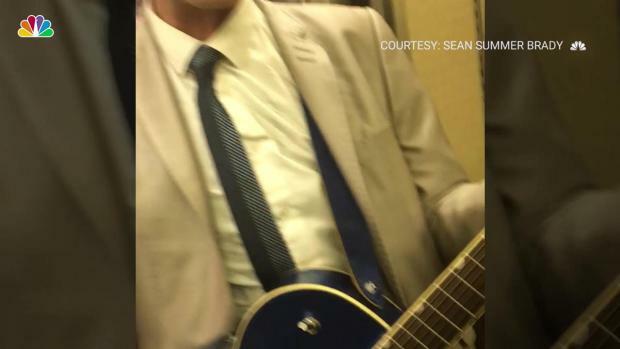 Sean Summer Brady, a teacher at a Manhattan school, took this video while confronting a subway busker who made a joke about transgender people on the train last Wednesday. As some subway buskers were being praised for their singing, others were causing offense, and being confronted for it. Manhattan teacher Sean Summer Brady, who is a transgender woman, filmed her interaction with a performer on the subway who dedicated the song '(You Make Me Feel Like a) Natural Woman' to "Bruce Jenner's surgeon." The video got thousands of views on social media, and Brady was praised for standing up for transgender rights, while LGBTQ groups reminded New Yorkers that bystanders should step up when someone is being put at risk. Dogs aren't allowed on the subway unless they are in a "container" or a bag.This doesn't stop New Yorkers with larger dogs, like this corgi-owner who simply popped her pet in a backpack for the ride. Subway ads can be divisive, but these posters from dating website OK Cupid had many New Yorkers amused. In the ads, the company redefines the acronym 'DTF' in multiple different ways. The NSFW acronym typically stands for 'Down to [expletive]' but the dating website repurposed the term with a series of photographs of other things New Yorkers want to do on dates (that start with the letter F, of course). Down to Finish My Book, Down to Fall Head Over Heels, and Down to Farmer's Market are all featured.